Boat Vent II - Properly Vents your boat cover. Prevent mold and mildew damage. Proper ventilation can keep these boat destroying fungi from attacking your boat! 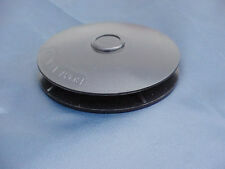 The patented Boat Vent II installs quickly and easily, with no screws or fasteners. The Boat Vent II is manufactured from a superior grade poly carbonate blend material for strength and UV resistance and will accommodate either 3/4" or 7/8" support poles. TOP OF THE LINE BOAT COVER. -Our TOP OF THE LINE Boat Cover will provide all year round outdoor and indoor protection. -Designed for Trailering purposes, as well as storage and mooring of your Boat. TOP OF THE LINE BOAT COVER. This cover is not designed to accommodate WAKEBOARD (SKI) Towers. 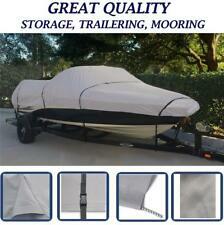 -Our TOP OF THE LINE Boat Cover will provide all year round outdoor and indoor protection. 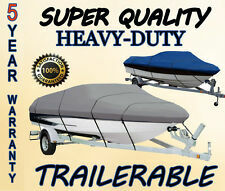 -Designed for Trailering purposes as well as storage of your Boat. Heavy-Duty, Trailerable with integrated trailering system. FEATURES OF OUR TRAILERABLE BOAT COVER This cover is not designed to accommodate WAKEBOARD (SKI) Towers. TOP OF THE LINE BOAT COVER. -Our TOP OF THE LINE Boat Cover will provide all year round outdoor and indoor protection. TOP OF THE LINE BOAT COVER. This cover is not designed to accommodate WAKEBOARD (SKI) Towers. -Our TOP OF THE LINE Boat Cover will provide all year round outdoor and indoor protection. -Designed for Trailering purposes, as well as storage of your Boat. Easy Up Privacy Partition. This partition provides privacy from on-lookers while out on the water. The partition is made from 100% marine grade polyester, and is easily secured with UV resistant tie downs and fasteners. Extend the life of your boat cover by preventing water from pocketing. The pole is aluminum, with a durable plastic adjuster to set the correct height for your cover. 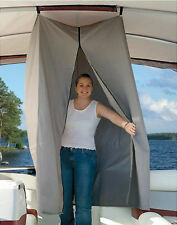 Boat Cover 3-in-1 Support Pole (36" - 64"). Proper Support lengthens the life of your Boat Cover! Extend the life of your boat cover by preventing water from pocketing. The system includes. Heavy-Duty, Trailerable with integrated trailering system. 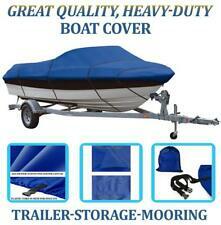 FEATURES OF OUR TRAILERABLE BOAT COVER TOP OF THE LINE BOAT COVER. This cover is not designed to accommodate WAKEBOARD (SKI) Towers. -Our TOP OF THE LINE Boat Cover will provide all year round outdoor and indoor protection. Essential for pesky bird droppings! UNIVERSAL Swim Platform Cover. Available in all of our primary fabrics to match your boat cover (or boat). up to 69″ wide at the outside edge of the platform- side to side length at rear of platform. Our TOP OF THE LINE Boat Cover will provide all year round outdoor and indoor protection for your boat. GREAT QUALITY, TOP OF THE LINE BOAT COVER. -Designed for Trailering purposes, as well as storage of your boat. Heavy-Duty, Trailerable with integrated trailering system. - Our TOP OF THE LINE Boat Cover will provide all year round outdoor and indoor protection for your boat. GREAT QUALITY, TOP OF THE LINE BOAT COVER. 48" Boat Bimini Stainless Steel Support Poles (Set of 2). off the gunwales with a pair of Bimini support poles. Keep your Bimini Boat Top. Bimini Top braces are specially designed to hold your top up and out of the way when top is folded and not in use. The main mounting point is the deck hinge. 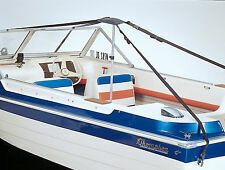 GREAT QUALITY, COMPLETE SET BIMINI TOP- 7oz Solution Dyed Polyester, 3 BOW, ROUND TUBE. Solution Dyed Polyester Bimini Top. Mounting Points will be the mid point of your Bimini top’s length. Our TOP OF THE LINE Boat Cover will provide all year round outdoor and indoor protection for your boat. GREAT QUALITY, TOP OF THE LINE BOAT COVER. -Designed for Trailering purposes, as well as storage and mooring of your boat. Attaches to almost any boat cover. Heavy-Duty, Trailerable with integrated trailering system. TOP OF THE LINE BOAT COVER. -Our TOP OF THE LINE Boat Cover will provide all year round outdoor and indoor protection. -Designed for Trailering purposes, as well as storage and mooring of your Boat. V-Hull Runabouts Outboard Boat Cover 14'-16' Beam 90"